CrossRidge is an active adult community on a 400-acre historic site in Glen Allen, a suburb of Richmond. This gated 55+ community is comprised of six individual neighborhoods, each with its distinct home style and its own association. The styles include condos, townhomes, duplexes, and single-family homes. All residents of CrossRidge in Richmond are members of the Pavilion Club where all the on-site social activities take place. On average, there are more than 100 scheduled events per month at the Pavilion. The amenities also include an activity staff, an active social events committee, and a variety of programs and clubs. The 8,000 square-foot Pavilion sits on five acres and provides numerous ways for staying fit and active or to relax and make new friends. It has a fitness center with indoor heated pool and spa, card and billiard rooms, a large meeting room, an outdoor pavilion, tennis courts, and an outdoor swimming pool. Besides private parties and community celebrations, the Pavilion also hosts computer classes, book discussions, poetry readings, artist displays, seminars, and continuing education classes. Residents of CrossRidge also get together for water aerobics, Pilates training, and yoga at the fitness center. 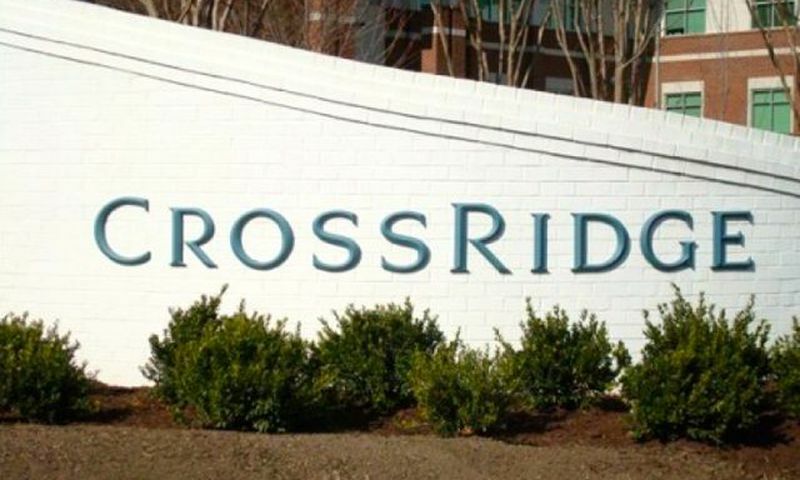 Established in 2001, CrossRidge in Richmond offers six different neighborhoods that now has a total 756 homes. All residences have attached two-car garages, at least two baths and feature easy main-level living. Sizes range from 1,760 to 2,360 square feet of living space with two, three, or four bedrooms. Two of the neighborhoods feature only single-family homes and an additional one is comprised of only townhomes. The remaining three neighborhoods feature duplex condominiums. One of these condominium areas is comprised of four two-story buildings. In that building the second floor units have private elevators. Most homes at CrossRidge of Richmond have either a screened porch or a sunroom. Some models also have lofts, formal dining rooms and casual eating spaces in addition to the great rooms. Each neighborhood has its own association that provides residents with a low-maintenance environment. The association dues include exterior home maintenance and repair, full landscape maintenance, refuse collection, road maintenance, and snow removal. Residents of CrossRidge at Richmond enjoy life to the fullest. Even their beautiful low-maintenance homes are built for ease of entertaining, with spacious single-level living and lots of room when family and friends come to visit. This is a very active community and southern hospitality reigns supreme. In any given month, not just the holiday season, the social calendar may contain over 100 scheduled events. Residents meet regularly for afternoon games, wine and cheese, game nights, and bridge parties. Arts and crafts lovers, technology enthusiasts, intellectuals, and exercise buffs alike will find clubs to suit their interests. The activities director also plans plenty of bus trips to many of the historic destinations in the area. CrossRidge is located next to the Village Shoppes, a shopping center where residents can easily find their daily needs. Other convenience stores are just minutes away. The closest mall is the Short Pump Town Center an outdoor mall that has everything from hair salons to a huge movie theater. Residents also have easy access to Virginia Center Commons, a premier upscale shopping mall in Glen Allen. There are many different restaurants, boutiques, historic sites, museums and other attractions all throughout Richmond. It is only 20 miles to the Richmond International Airport, making long-distance travel very convenient. Colonial Williamsburg beckons 45 minutes to the east, and visitors are sure to enjoy this amazing historic setting. A little further east, located along the Atlantic shoreline, are the cities of Virginia Beach, Norfolk, and Chesapeake Bay each with its own appeal and array of attractions. Pavilion Club - 13,000 Sq. Ft. There are plenty of activities available in CrossRidge. Here is a sample of some of the clubs, activities and classes offered here. CrossRidge is home to many duplex style condominiums. These condos typically range from 1,760 to 2,330 square feet. They offer two to three bedrooms, two bathrooms, and an assigned parking space. Please Note: All floor plans are not available at this time. CrossRidge also offers a multitude of townhomes. These townhomes typically range from 1,869 to 2,334 square feet. They offer two to four bedrooms, two to two-and-a-half bathrooms, and an attached two-car garage so you don't have to worry about parking. Please Note: All floor plans are not available at this time. We bought in Crossridge because we are no good at garden work. We were told "everything on the outside is taken care of" by the HOA. It's not! They do cut grass and apply fertilizer, herbicides, etc. They do trim bushes, even when not necessary. And they repaired the roof and trim when there was a problem. They do plow the streets if snow gets over 3". However, we had two trees dies within the second year. We were told their definition of a living tree is one green leaf on it. Now our hedges are dying. The front flower beds are full of weeds. We put in a work order for that and were told they had not gotten around to that yet. We love the layout of the house, though it is cheaply built. But all house are built that way today. Crossridge is a wonderful community. The clubhouse and grounds are beautiful and the homes are well kept. The neighbors are friendly and welcoming. The location is perfect as it is close to I 64 and I 295 and only minutes from downtown Richmond. I would recommend this neighborhood to anyone looking for a 55+community in the Richmond area. We watched this neighborhood being built and at the time were not ready for a move. This winter we contacted Rick Perkins with intent of taking 1-2 years to find a 55+ neighborhood to move to. Thanks to Rick, within several months we found our "right size" home here in CrossRidge. CrossRidge offers not only beautiful unique homes, but also a vibrant community. Everyone is so friendly and welcoming. There are numerous monthly activities to get involved in if one choses; women's club, pickle ball, exercise, art, travel, and much more. CrossRidge offers an active 55+ community in a beautiful setting. We are so happy with our move. I didn't know their was a place as nice as this in Richmond. Communities in Richmond all seem to be much smaller, but CrossRidge is exactly what we were looking for. The clubhouse is just what we hoped for. The fitness room is great, the swimming pool is really nice and they even added onto the clubhouse to make it bigger. The residents are some of the nicest people we have ever met. We really enjoy living here. We've lived at CrossRidge for a couple years and love how friendly the community is. There is always something you can participate in and I myself am very active in the community. My husband enjoys is too, although he said he wasn't really in to it at first! Our home is very nice and is a really unique floor plan compared to many of the other cookie-cutter looking homes we saw at other communities. 55places.com is not affiliated with the developer(s) or homeowners association of CrossRidge. The information you submit is distributed to a 55places.com Partner Agent, who is a licensed real estate agent. The information regarding CrossRidge has not been verified or approved by the developer or homeowners association. Please verify all information prior to purchasing. 55places.com is not responsible for any errors regarding the information displayed on this website.